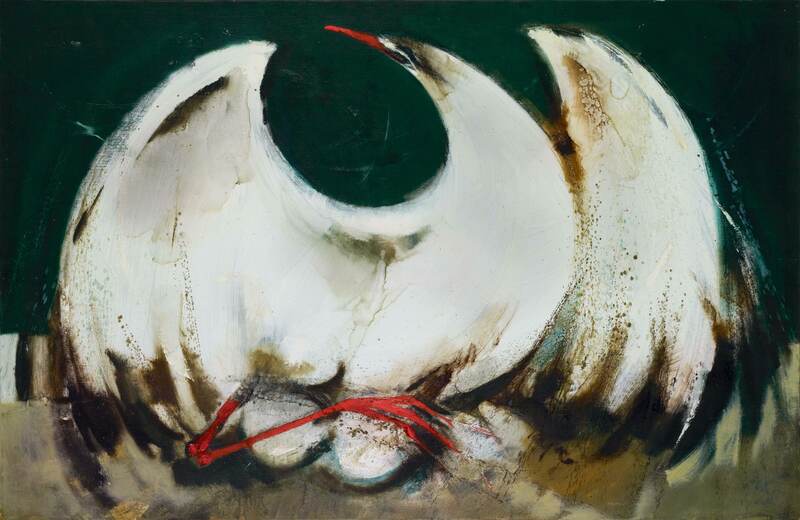 William Pajaud Sea Bird on Nest, n.d.
Sea Bird on Nest is part of a larger series of expressionistic paintings of diving birds, a subject chosen by Pajaud for its formal interest. The contrast of the stark white feathers against a pitch black sky creates a chiaroscuro effect that is intensified by the vibrant red of the bird’s foot. Pajaud was one of the first African American artists to attend the Chouinard Art Institute, which later became California Institute of the Arts. "Sea Bird on Nest." Now Dig This! Art in Black Los Angeles, 1960–1980 Digital Archive. Los Angeles: Hammer Museum, 2016. https://hammer.ucla.edu/now-dig-this/art/sea-bird-on-nest.